We have reached the Elite 8 in the Sixty-Four Novelist March Madness Style Tournament to determine whom readers believe is the best novelist or the most beloved novelist. The winner of the Stephen King Bracket will face the winner of the Cormac McCarthy Bracket. We have reached the Elite 8 in the Sixty-Four Novelist March Madness Style Tournament to determine whom readers believe is the best novelist or the most beloved novelist. Vote often and thanks for your participation! In my last couple of posts, I revealed the authors who made the Sixty-Four Novelists March Madness Bracket Style Tournament to determine who is the best novelist or most beloved novelist in North America. We had thirty-two novelists in the Stephen King Bracket covering pop & genre fiction and thirty-two novelists in the Cormac McCarthy Bracket covering literary fiction. I will reveal the Sweet 16 results on my next post and pick the match-ups for the Elite 8. Vote often! Who is the best novelist? Who is the most beloved novelist? Well in my last post, I attempted to get those questions answered by doing a NCAA March Madness Bracket Style for the best novelists in North America. I got a great response to my last post and I want to thank everyone who has voted and provided comments about the bracket. I was glad to see that serious readers can have a little fun. I released the Stephen King Bracket of 32 novelists covering genre & pop fiction in the last post. Now, it’s time to release the Cormac McCarthy Bracket covering Literary Fiction. Let’s have some fun and vote often!! Well, I wanted to have some fun and see if I can get an answer those two questions. Since it is the month of March and the NCAA College Basketball Tournament is coming in the next few days. 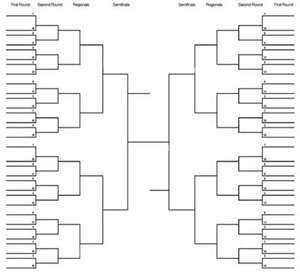 I thought of getting those aforementioned questions answered with a Sixty-Four Novelists March Madness Bracket Style Tournament. –I have chosen 64 novelists and divided into 2 brackets. 32 Novelists for the Pop/commercial Fiction Bracket and 32 Novelists for the Literary Fiction Bracket. For this week’s blog post, I’m releasing the Stephen King Bracket and that covers genre fiction (science-fiction, mystery/thriller, horror, romance, and Christian Fiction) and mainstream pop fiction. For next week’s blog post, I will release the Cormac McCarthy Bracket and that covers Literary Fiction. The authors in each bracket are seeded one to thirty-two. And the match-ups like the NCAA Tournament are created to get one winner from each bracket. Then the winner from the Stephen King Bracket will meet against the winner of the Cormac McCarthy Bracket to determine who is the best novelist and winner of the tournament. Now the readers will select the winner for each matchup in the corresponding bracket. For example, Stephen King is the 1 Seed and he will face Terry Brooks who is the 32 seed as the first match. Whoever gets the most votes from that match will win and go to the next round called the Sweet 16. Then those winners from the Sweet 16 will go onto the Elite Eight for the next round. The Elite Eight Winners will go on the Final Four after that and then the Final Four winners will go on to the Terrific Two and so on until we get the tournament winner and crown the best novelist. Readers can vote on the match-ups as many times as they want within the time range selected by the tournament chairman (yours truly). You can place your votes here, Goodreads, or Library Thing, or email me at kammbia1@gmail.com. The Round of 32 matches starts today for the Stephen King Bracket and I will need all votes for the matches by Tuesday March 19th at 11:59 p.m. I will release the Sweet 16 from the Stephen King Bracket on Saturday March 22 and the Cormac McCarthy Bracket Round of 32 at that time. Let’s have some fun and vote often!! !